New Rochelle, NY, April 10, 2019–In light of the continuing anti-vaccination movement, a provocative new article provides a comprehensive overview of the potential risks of vaccinating breastfeeding women. The article, which determined that only smallpox vaccine and, in some circumstances yellow fever vaccine, are the only vaccines having the potential to cause harm to infants, is published in Breastfeeding Medicine, the official journal of the Academy of Breastfeeding Medicine published by Mary Ann Liebert, Inc., publishers. Click here to read the full-text article free on the Breastfeeding Medicine website through May 10, 2019. In “Maternal Vaccination and Breastfeeding,” Philip Anderson, PharmD, University of California San Diego, Skaggs School of Pharmacy and Pharmaceutical Sciences, reviewed all of the most common types of vaccines, including inactivated and live attenuated types for the unsubstantiated concern that they would cause harm to a nursing infant or interfere with the infant’s response to early childhood vaccinations. Included in the scope of Dr. Anderson’s review are routine vaccines such as influenza, diphtheria, pertussis and tetanus (DPT), varicella and measles, mumps, and rubella (MMR). The article also focuses on vaccines related to exposure or special risk factors, such as hepatitis A or hepatitis B, and specialty vaccines including cholera, yellow fever, smallpox, rabies, and typhoid. 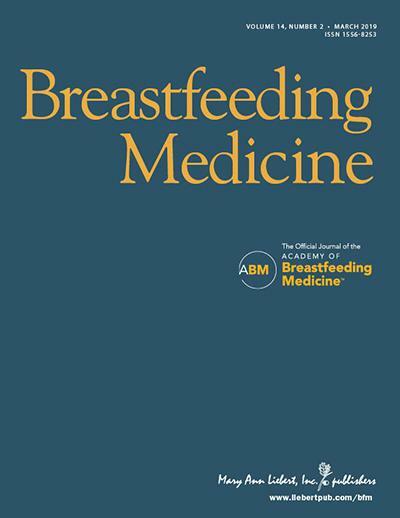 Breastfeeding Medicine, the official journal of the Academy of Breastfeeding Medicine, (https://www.bfmed.org/) is an authoritative, peer-reviewed, multidisciplinary journal published 10 times per year in print and online. The Journal publishes original scientific papers, reviews, and case studies on a broad spectrum of topics in lactation medicine. It presents evidence-based research advances and explores the immediate and long-term outcomes of breastfeeding, including the epidemiologic, physiologic, and psychological benefits of breastfeeding. Tables of content and a sample issue may be viewed on the Breastfeeding Medicine website. Mary Ann Liebert, Inc., publishers is a privately held, fully integrated media company known for establishing authoritative peer-reviewed journals in many promising areas of science and biomedical research, including Journal of Women’s Health, Childhood Obesity, and Pediatric Allergy, Immunology, and Pulmonology. Its biotechnology trade magazine, GEN (Genetic Engineering & Biotechnology News) was the first in its field and is today the industry’s most widely read publication worldwide. A complete list of the firm’s 80 journals, books, and newsmagazines is available on the Mary Ann Liebert, Inc., publisher’s website.